Fees: $135 » Fees must be paid in full at time of registration. (Non refundable after December 15, 2018.) Fee includes four hours of instruction, over 22 feet of sterling silver wire! a jeweler’s polishing cloth, a fleece work surface and a copy of her 12 page instruction book featuring complete instructions with color step by step photographs, all of which is yours to take home. She will also provide all tools for you to use in class so it is not necessary for you to bring anything. This bracelet is a bit complicated however it can be done by those with basic wire wrapping experience as well as the ability to follow directions carefully! Beginners should probably not attempt this project unless they are very good with their hands. 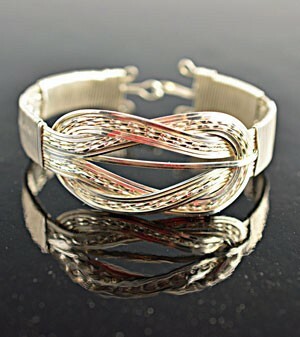 However, experienced wire wrappers will enjoy this bracelet. You will not only be proud to wear this home in style, you will also learn how to re-create this bracelet in various sizes. You can vary the look by using different metals in various combinations. You will want to make several! It is spectacular. I will quickly review the basics about wire temper, gauges, and shapes as well as tools. You will learn how to measure enough wire, how to correct the length for different size bracelets, how to bind your bundle of wire, how to make a hook and catch, how to bend wire and how to make an attractive bracelet. Inasmuch as all tools are provided during the workshop, all you need to bring is a willingness to learn! For more information and to sign up for the workshop email Merilou at meriloupjenkins@yahoo.com or call 951.634.4302. Class size is limited to 8 so register early!